Each one of these topics contains more than enough material for an entire course, so today's introduction cannot do much more than skim the surface of what linguists mean by semantics and pragmatics. Both semantics and pragmatics have to do with the meaning of language, and link language to the world. For lack of time within the space of one lecture, we will deal mostly with Pragmatics, but you should read carefully Crystal's section on Semantics as well (section 17, pp. 100-107), and these notes will hit the high points of what you are responsible for in semantics. Feel free to treat sections 18 and 19 (pp.108 - 115) as background reading, but pay close attention to sections 20 "Discourse and Text" (pp.116-119) and 21 "Pragmatics" (pp. 120-121). They are essential background to today's lecture. 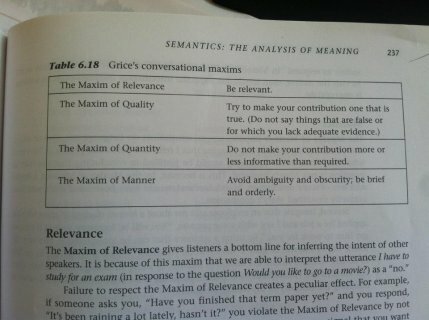 The most general definition of semantics is that it is "the study of linguistic meaning", according to Crystal, or "the study of the meaning of words and sentences", according to Language Files. Though we may find it easier to think of words as relating to "things" in the world (as Crystal discusses under the heading of 'reference'), semanticists point out that many words do not in fact refer to the extermal world at all. In using the term sense rather than reference, Crystal explains that "the focus of the modern subject [of semantics] is on the way people relate words to each other within the framework of their language" (p.102). (4) incompatibility - mutual exclusiveness within the same superordinate category, e.g. red and green. We already discussed homonymy in the morphology lecture, but in thinking about lexemes as dictionary entries, it is important to distinguish homonymy from polysemy. Although it is not always easy to make the distinction, homonymy means that there are two different lexemes that, as Crystal puts it, "have the same shape", by which it seems he is trying to be neutral as between spelling and pronunciation. He gives the example of bank1, 'an area of ground'; and bank2, 'a building'. In contrast, polysemy means one lexeme that has several meanings, and here he gives the example of chip, which can be either of wood, of food, or electronic crcuit. Personally (GS), I am not so convinced about the electronic chip, which I think I would list as a separate word in the dictionary! In distinguishing polysemy from homonmy, understanding the concept is easier than putting it into practice.